(L)Tej "Honey Wine" Ambo "Mineral Water" (R) Tibs "Fried Lamb with sauce on injera"
Click on all photos to view!! 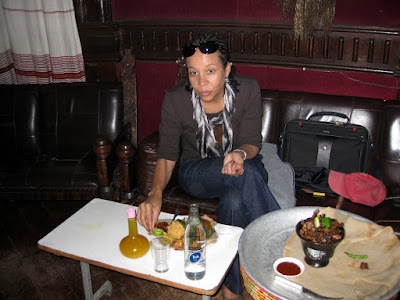 Ethiopian food is delicious, very spicy and you can eat well just about anywhere in the country. Ethiopia is a fertile country, contrary to many people’s expectations; they have rich soil, but the country is hit by drought and food shortages in some areas from time to time. 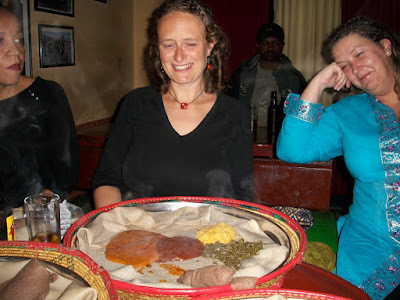 Food is very easy to find in Ethiopia, and portions in restaurants are very generous and cheap. For a delicious lunch for two, I paid birr 28, which is just about US$2.50. 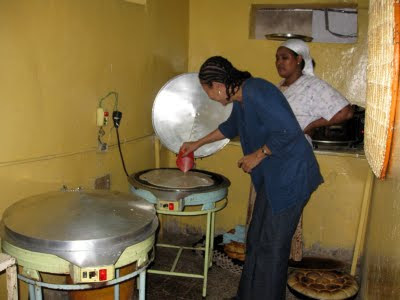 You can also get many types of dishes there and most of them are unique to Ethiopia. It is a good idea to get to know the names of them as soon as you arrive in the country. Basket with Injera and Vegetarian "Wat"
The staple food of Ethiopia is "injera"; a large, spongy, sourdough pancake like bread made from "tef" (wish I could describe it in fewer words, but I can't). 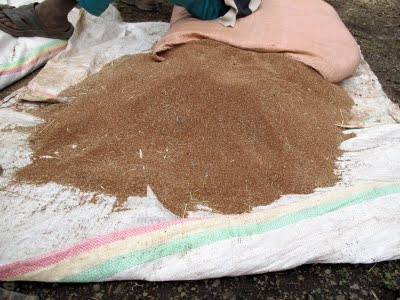 Tef is a grain that is unique to Ethiopia and comes in varities; white, brown and red. 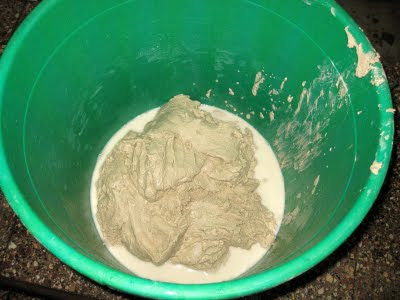 The tef is made into a-flour like substance that is mixed with water and left to ferment in a large container for up to three days. 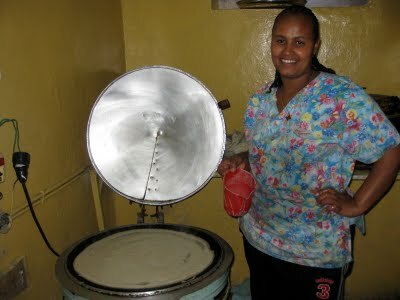 It is then mixed to a watery consistency, poured and cooked on a large griddle for three to five minutes. The result is a spongy, rubbery texture pancake that has a slight sour taste, somewhat like sourdough bread. 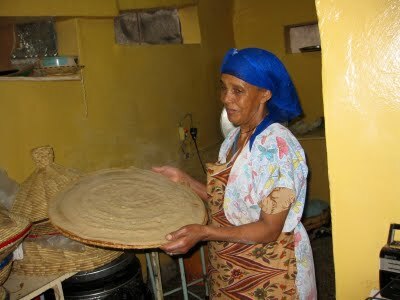 The injera is served on a large plate or basket with “wat”, a vegetable or meat stew. 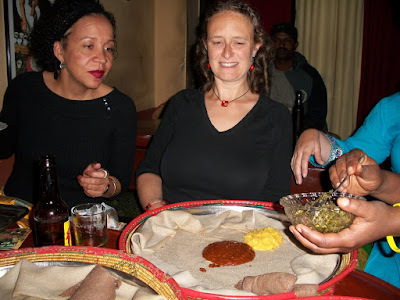 The idea is to take a piece of injera in your right hand and use it to scoop up the “wat” into your mouth; no utensils are used. 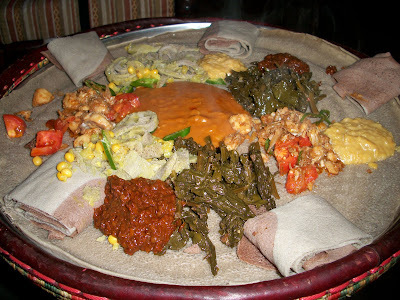 If you are ever invited to dine with Ethiopians in their home, it is their custom for everyone to eat off the same plate. Injera is a very nutritious food that is high in fiber, containing twenty times more calcium than wheat or barley, three times more iron than other grains and symbiotic yeast, making it the only grain that does not need yeast for preparation. Wat sauce comes in two types; “kai wat”, which is red in color, flavored with beriberi, a very spicy red pepper, garlic and onions boiled in ground meat. 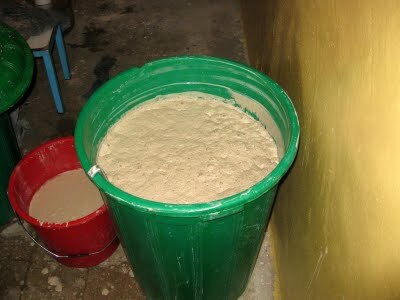 The other type is “siga” made from lamb, goat or beef meat. The most popular meal is “doro wat,” a dish of chicken pieces in sauce. Wednesdays and Fridays are fasting days for the Ethiopian Orthodox Christians. This simply means that they do not eat meat on these days. 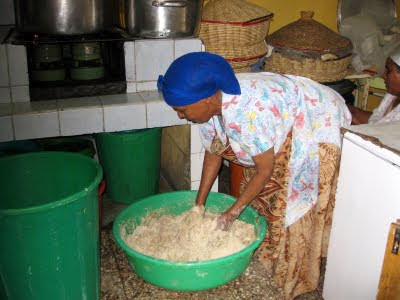 Vegetarian wat is mainly served on these days and can be made from beans, lentils, spinach, gomen (Ethiopian cabbage) and beets; fried or pureed and serve in little piles on the injera. You can also get fried meat “Tibs”, which is very popular. 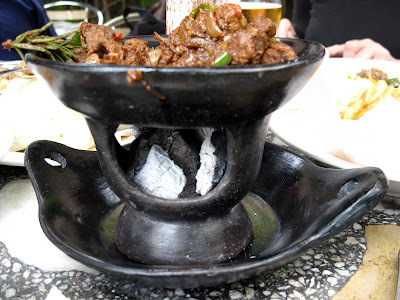 There is also another dish called “kitfo”, but I did not try it because it is made from raw beef. 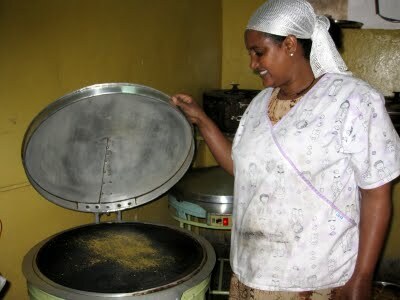 For breakfast, the most popular dish is “injera firfir” which is pieces of injera soaked in sauce. Another dish is “inkolala tibs” which is scrambled eggs with onions, green peppers and tomatoes. Also popular for breakfast are fried potatoes with Ethiopian butter. 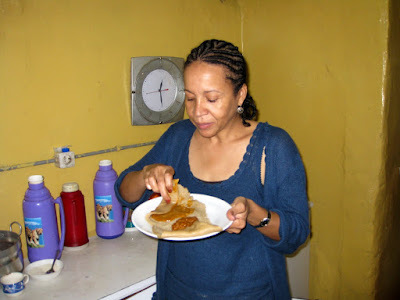 You can also get varieties of western style food for breakfast at many restaurants in Addis and many large towns. Nice to know that you reached the continent, and the spiritual capitol of all black peoples of the world, the home of the black God, Jahovia Haile Selassie and Black Saints. It must have been a very refreshing trip, but also vital to the soul to have walked on a peice of the earth that God resides. Thank you for this beautiful pictures and review of your trip. I am unable to make such a trip and it can help me live in the moment at the time. My heart cries for Ethiopia and thank you. Debbie, thank you very much for your comment. 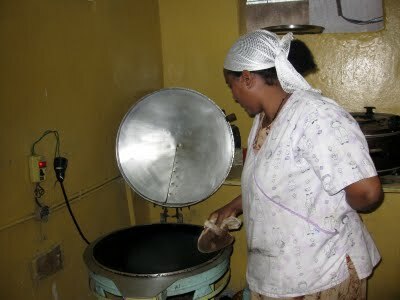 Ethiopia is a unique country and the Ethiopian people are among the nicest in the world. One day you will also be able to visit Ethiopia. Anjera and tibbs are just perfect. I fell in love with Ethiopia and will possibly visit again next year and take my time there this time! Thanks for visiting my site Imran. I too fell in love with Ethiopia and it's people; I'm planning on going back soon.